Heat oven to 350°F. In 1-quart saucepan, mix granulated sugar, brown sugar, flour, salt, milk, and butter. Cook over medium heat until butter is melted and sugar is dissolved, stirring constantly. Set aside; cool. Make pie crust as directed on box for Two-Crust Pie using 9-inch glass pie plate. In small bowl, whisk 1 egg, the egg yolk and vanilla. Stir egg mixture into sugar mixture in saucepan. Stir in lemon juice and peel. Pour into crust-lined plate. Top with second crust and flute; cut slits in several places. Brush beaten egg over top crust. Cover crust edge with strips of foil to prevent excessive browning. Bake 45 to 55 minutes or until golden brown. Cool at least 2 hours before serving. Serve with whipped cream. Store covered in refrigerator. Matt Rossi of Ada, Michigan, took 1st Place with this recipe at the Pillsbury Refrigerated Pie Crusts Pie Baking Championship, 2009 Michigan State Fair. 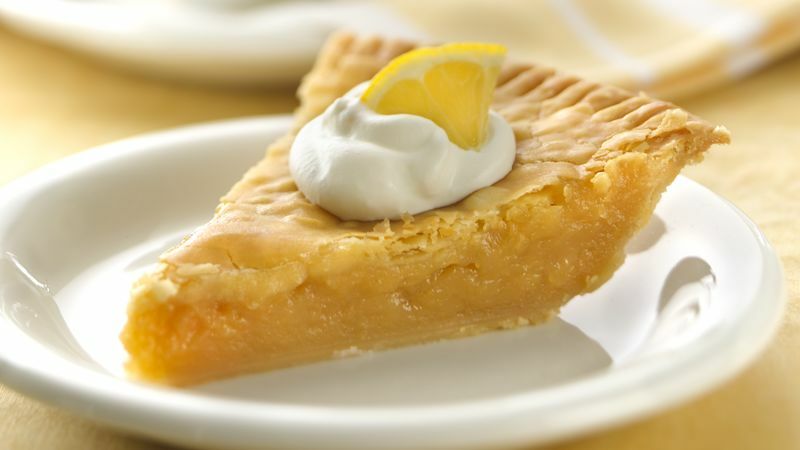 For a pretty serving presentation, add a curl or two of lemon zest on top of a dollop of whipped cream on each slice.